Last night my husband and I went into downtown L.A. to see another play. This time we saw Seminar, staring Jeff Goldblum. In many ways this last week mimicked our first week dating because during that week we watched a play by David Mamet (Glengary Glen Ross) and also a play featuring Jeff Goldblum (The Pillowman). We saw these plays while living in New York and the rest was history! As you can see I have moved from big city to big city. 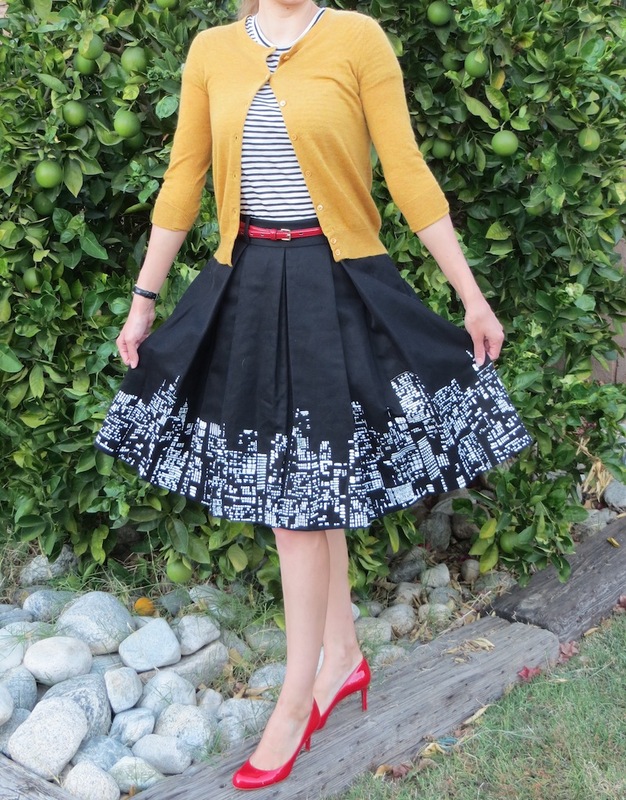 To match the festive downtown scene and the bright lights of the city, what better skirt to wear than the Kate Spade "City Lights Lilith" Skirt? I received several compliments on it from some of the other theater goers sitting in our section. 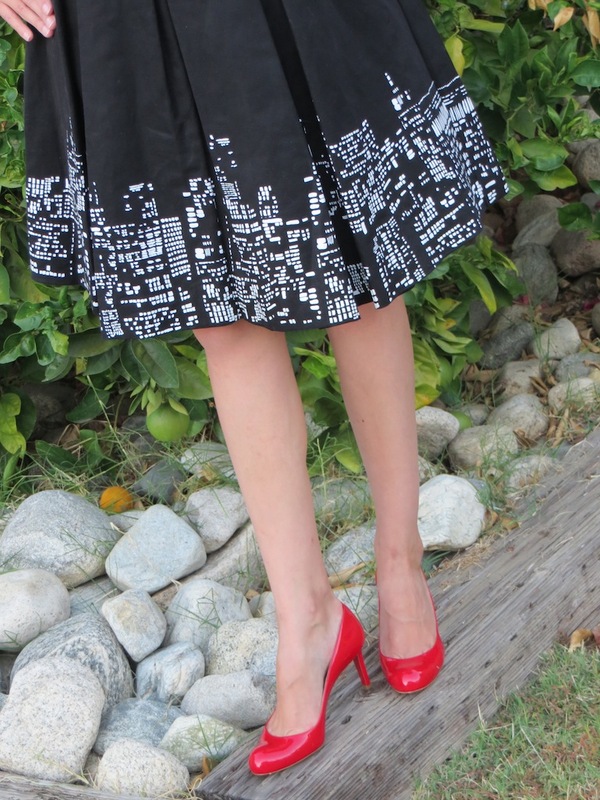 I decided to pair the skirt with red accessories, including a fashionable belt from Target and red Christian Louboutin Simple pumps. Below is a view from Pete's, the restaurant we dined at before the show. If you want to have the best fries you have ever had in your entire life, go to Pete's. They make blue cheese fries which are to die for! We have eaten here on occasion and asked for an extra order to go because they are that good. If I am ever put on death row, I think my last meal will include a heaping pile of Pete's cheese fires. This is the Barclay Hotel which is situated across the street from Pete's. Apparently, Henry Huntington stayed here while he was waiting for his "little" place in San Marino (now the Huntington Library) to be built. 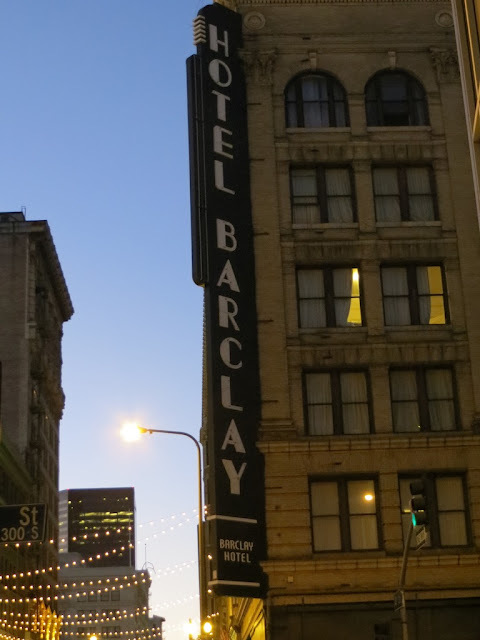 The Barclay is now apartments for single resident occupancy. It is sort of amazing that a business tycoon such as Huntington stayed here. If only there had been a Pete's at the time, he could have also shared in the cheesy goodness of their fries. You missed out Huntington, but I guess your palatial estate and exquisite art collection makes up for it.